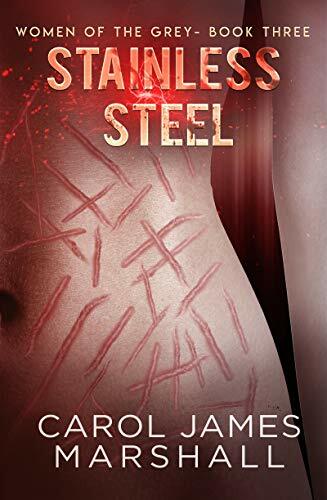 Stainless Steel is the final book in the Women of the Grey Trilogy by Carol James Marshall. This final chapter follows primarily only a handful of the original women from the prior books as well as a few new ones as they grapple with the truths of the Grey and their reaction to it. Lisa has resurfaced with a vengeance, as the original Woman of the Grey along with her partner and unlikely friend Israel. Having been sent back out into the world on a breeding mission during Red Drug, Lisa has rejected all ideologies of the Grey and has taken to acting as a bounty hunter of her sisters on missions. Viewing herself as an “Angel of Mercy” her self-imposed directive is simple – reject the Grey or die. Teresa has returned to the Grey after several failed breeding missions. In the world of “all the same and none different”, she learns the truth of what it means to be an anomaly in the sterile world of sameness. Trapped in a never-ending cycle of experimentation and recuperation, Teresa resolves to break out of the prison imposed on her by the Originals and leave the Grey, even if it’s the last thing she does. June is an opportunist. Acting as Superior Mother’s right-hand woman, she is conscripted by the leader to hunt down Lisa. But this isn’t the only mission June has; her secondary unsanctioned mission is to bring back the Red that the Women of the Grey crave to the point of their detriment. As the demand for Red becomes larger and larger and the payouts become bigger, June plans an exit strategy that will take her away from the oppression of her people. To say that this final installment is tense is an understatement! The women are falling apart and turning against each other as their own fears and suspicions come to the fore to take precedence over the status quo. Superior Mother grapples with her own emotions and scandals as she strives to maintain power amid the ever-increasing need for the Red and the worry over her daughter. The women are at each other’s throats literally and figuratively as forces both outside and inside their mountain lair clash in a climax that can only be described as explosive. If you aren’t familiar with the series to date, I would suggest going back and reading “Starburst” and “Red Drug” before attempting “Stainless Steel”. While this series isn’t exactly one where the reader will be totally lost without reading the first two books in the series, the overall enjoyment will be enhanced by knowing the backstories of all players involved. Luckily, Marshall is also releasing the series as a box set soon. While there is a definite closure to the series and the Women as they currently exist, Marshall leaves the door slightly ajar to revisit the alien women in the future. It will be interesting to see if any further shorts are explored as follow-ups or sidebars to the original trilogy. But, even if we never learn the fate of those who remain, the saga of the Women of the Grey has ended and unlike other series I have read, has not left me lacking or seeking further answers. If you love all things bizarre, creepy and twisted you will definitely enjoy this series.